This concise, informative book is still the only one of its kind, and remains an indispensable resource for veterinarians and veterinary students worldwide. It is a unique combination of state-of-the-art information from previous editions and new information from the latest developments in clinical veterinary medicine. 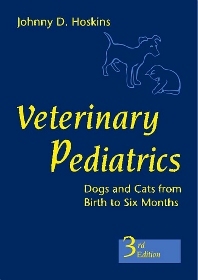 Each topic is described in a succinct manner so that the text can serve as a quick reference resource of dogs and cats from birth to six months of age, whether healthy or afflicted with a congenital or acquired illness. The Physical Examination and Diagnostic. Radiology/ Ultrasonography. Behavior Development and Behavioral Disorders. Drug and Blood Component Therapy. Fading Puppies and Kittens: Diagnosis and Management. Sepsis in Puppies and Kittens. The Preventive Health Program. TheRespiratory System. The Cardiovascular System. Dental Disease and Care. The Digestive System. The Liver and Pancreas. The Skin. The Ear. The Eye. The Hematopoietic System, Lymph Nodes, And Spleen. Endocrine and Metabolic Systems. The Urinary System. The Musculoskeletal System. The Nervous System. The Reproductive System. Nutrition and Nutritional Disorders. Toxicology. Environmental Injuries. Anesthesia and Surgical Considerations. Appendices.